Is this not a possible source of this theoretical 9th planet? Oh, it does huh? Quite the span of orbit possibilities there LOL. What I dont get, is how we can see the effects of Planet Nine on Keiper Belt Objects, why then cannot we 'see' this hypothetical Planet? Would it not at least pass in between us and some distant object, like a star or galaxy, or anything detectable? Oh, it does huh? Quite the span of orbit possibilities there LOL. That's not a range of orbit possibilities, as if it's a perfectly circular orbit somewhere between those distance values... It's the minimum and maximum distance of the planet from the sun, given it's theoretically odd, elliptical orbit. why then cannot we 'see' this hypothetical Planet? Would it not at least pass in between us and some distant object, like a star or galaxy, or anything detectable? We're currently trying to pin down it's most probable position in it's very large orbit, based on models of orbital dynamics. We've already constrained it's likely position considerably, but there's still a lot of sky to search. Stellar occultation just might be the best way to spot the thing. I have no doubt that, right now, people are searching past and current images of the star field for occultations related to this hypothetical planet as we discuss. That makes sense with the elliptical orbit, I did not think of it like that. Thank you for your response. I love it when people reply with information and do not include insults with it, LOL. Good Luck with your search! It may just be me, but I get really annoyed when people can't even COPY a name from an article correctly - Kuyper Belt. Not Keiper Belt. If you're this cavalier with details, it makes me wary of trusting the rest of what you write. There's no mention of Kuiper Belt in the above article. If you're this cavalier with reading comprehension and pretentious enough to incorrectly correct someone it makes me wary of trusting the rest of what you write. It'd have to emit some light and it's likely very cold so it won't be easy to find on infrared wavelengths. The other option is that it has to have a chance transit with a star as we're watching it. It's suspected to have an orbital period of 10k years at the fastest. I don't know the math for the ellipse but that'd be 28 years to pass through a degree of sky if the orbit was circular. (10k/360=27.777777...) The ellipse and our relative position inside the orbit makes this time relatively useless but It does help to illustrate the kinds of time we have to invest in finding it in a given place in the sky without more info. Hope this helps a little. Kuyper Belt. Not Keiper Belt. If you're this cavalier with details, it makes me wary of trusting the rest of what you write. What a douchebag. Anyway I will try to be more careful with my spelling, I originally wrote KBO, and decided to spell it out. I make these comments quickly at work, so its not thorough scientific stuff. Besides, they are Comments, not updates, not scientific rebuttals. The sad thing is that while scientists do the difficult work of searching for unknown celestial bodies, meanwhile Trolls search for typos in the comments section of websites, just so they can feel a little better about themselves, while anonymously trashing someone else. "However, an interloping star is more likely to pull Planet Nine away completely and eject it from the solar system." 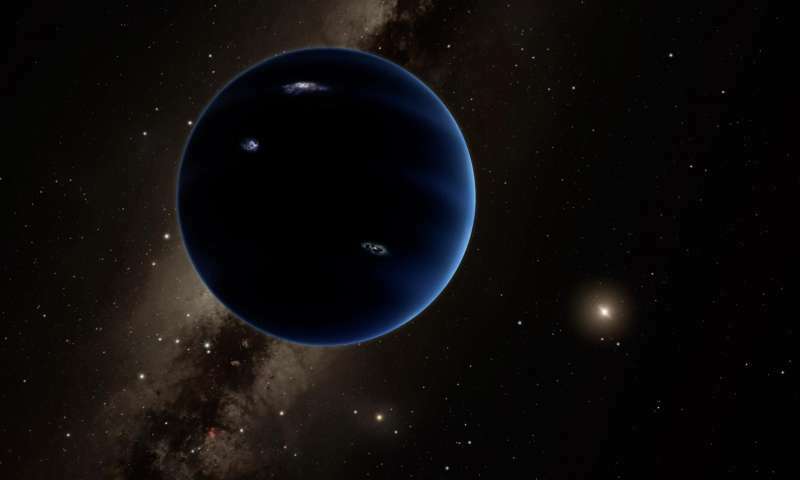 Maybe Planet 9 existed long enough to have the effect on certain Kuiper Belt objects Astronomer Mike Brown observed, but was subsequently ejected from the solar system. In any case, that ol' gut feeling that Planet 9 is a wild goose chase keeps getting stronger and stronger. "The Sun was born in a cluster where encounters with other stars were more frequent. Planet Nine's wide orbit would leave it vulnerable to ejection during such encounters." I like orbit expert and PN 'discoverer' Batygin's own theory best (though I would like to see simulations). E.g. PN was ejected in the first 10 Myrs or so and braked by gas and dust interactions with the remaining protoplanetary disk. Precisely because the Sun was still in its birth cluster the event had to be confied to where it's at now. The 6th ejected gas giant is less likely. since that would put unusually many planets in our system originally. With PN the system is "just right", more Neptunes than Jupiters. What I dont get, is how we can see the effects of Planet Nine on Keiper Belt Objects, why then cannot we 'see' this hypothetical Planet? Because it is difficult ? It is not like going to the fridge to get another beer. So, we're reasonably certain it's out there somewhere. And we have narrowed the possible places to look. Looking forward, has NASA given any consideration to launching a probe to take pictures and measurements? I know it may seem a bit premature to be doing this planning, but given the lead time necessary to get something off the ground, they might want to at least be looking at the potential to do so. Comments? "Because it is difficult ? It is not like going to the fridge to get another beer." Might be, if your fridge is in Antarctica.